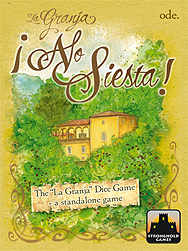 In La Granja: The Dice Game - No Siesta! 1-4 players manage farms around the Alpich pond near the village of Esporles on Majorca. Players extend their farms, bring goods to the market, and deliver them to more distant places as well. Players use "dice drafting" for their actions. They may collect resources for victory points, or hire helpers to employ special effects. Barns can be added to store goods. Sometimes you can even take a siesta! La Granja: The Dice Game - No Siesta! is a standalone dice game, and a follow up to the hit game, La Granja.